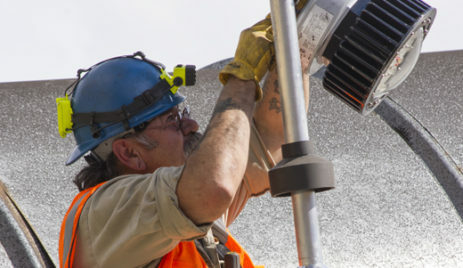 The new, patent-pending V-Spring Telescoping Light Pole from Eaton’s Crouse-Hinds business increases safety and decreases labor costs associated with lighting installation and routine maintenance. Its innovative design allows Install and maintain lighting fixtures without ever leaving the ground. Transition from protecting the worker to eliminating the risk. Spring assistance allows the luminaire to be lowered safely and easily – eliminating the need for portable ladders and fall prevention equipment. When compared to 45 degree lowering systems, the V-Spring’s spring assisted vertical movement requires 65% less force to raise or lower and removes mechanical stress on the handrail by over 300%. The vertical travel of the V-Spring allows the luminaire housing to properly hang from the mounting module hinge during installation and maintenance. No risk of dropped or falling ballasts. Download the Crouse-Hinds V-Spring Telescoping Light Pole brochure below or call 714.835.6211 for more information.